The Noses: a very important gap in the uplands along the Mohawk River. 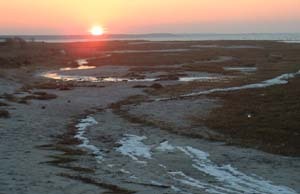 Beach on Long Island's North Coast: much of the landscape of New York has been altered as the result of the last Ice Age. Long Island is built from a glacial moraine. 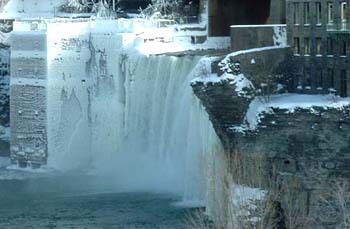 Niagara Winter: The climate of most of New York State is continental: warm summers and cold winters. 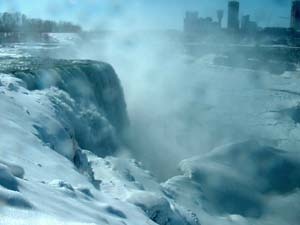 In January the mighty falls of Niagara often have a crusty frosting of ice. 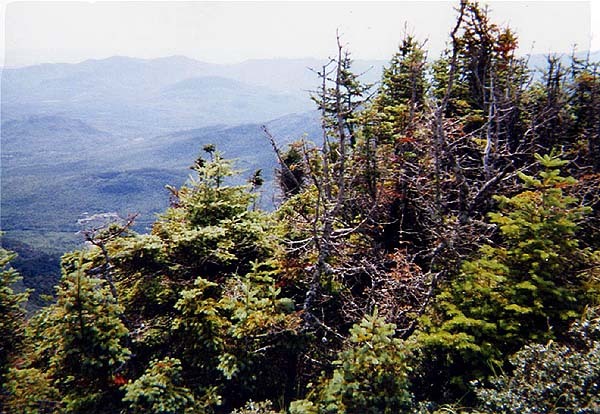 High Peaks: The high elevations of the Adirondacks have their own climate due the cold temperatures (even in mid-summer). At around 4000 feet, even the hardiest trees struggle. This is called the krumholtz, or "crooked wood." Springtime in New York: When spring finally arrives in New York, it is a time of beauty and color. 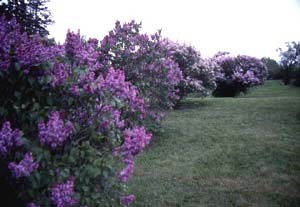 Rochester celebrates its world-famous Lilac Festival in mid-May. 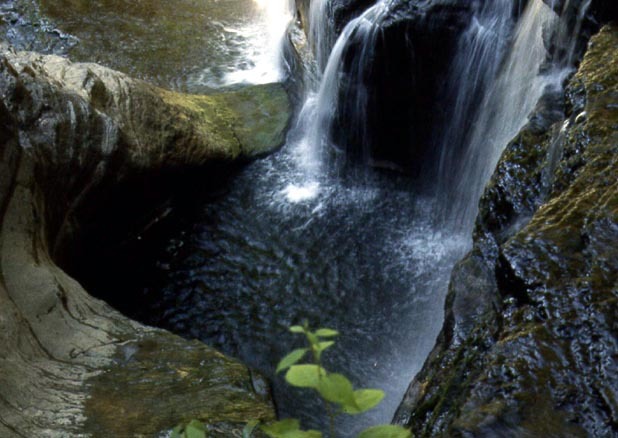 Minnewaska State Park sits on top of the Shawngunks in Ulster County. The white rock is a form of conglomerate, cemented pebbles laid down in a shallow sea around 400 million years ago. 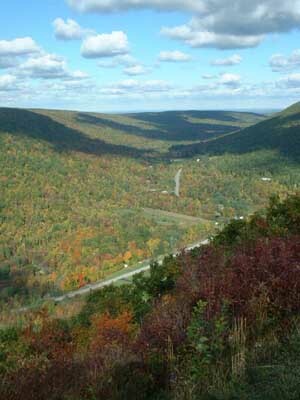 The Finger Lakes Region is famous for its glens, narrow valleys with small streams cascading down to the deep valleys below. This graceful waterfall is in Buttermilk State Park near Ithaca. 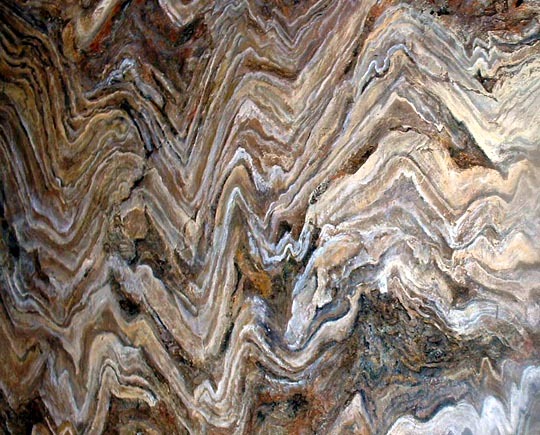 Folded Rocks (shown here in Rose Center at the Museum of Natural History in New York City) testify to the violent geologic past of the Northeast. Hard metamorphic rock gives support to Manhattan's skyscrapers. To understand and to appreciate the geography of New York State, you first must know something about the physical landscape. The location of our lakes, rivers, mountains, and coastal lowlands has determined the pattern of settlement in the state, as well as history and cultural development. Most of New York State is underlaid by sedimentary rocks: sandstone, shale, limestone, and conglomerate. This tells us that much of geologic history, the state was under water, especially during the Paleozoic Era between 500 to 300 million years ago. 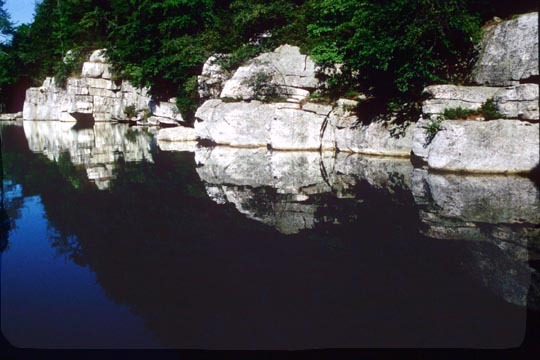 Very thick deposits formed at the bottom of that ancient sea, and the resulting rock layers are visible in many places - the Niagara Gorge, the Genesee Valley, the Finger Lakes, and the Hudson Valley - just to name a few locations. 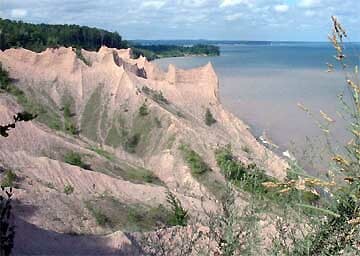 There are several places, however, that show a different geologic past. Most of New York City and the Hudson Highlands, for example, have exposures of igneous and metamorphic rocks. This tells us that these parts of the state had a violent history of volcanism and colliding tectonic plates. At one time there were mountains thousands of feet high, but they have eroded down to their roots. The skyscrapers of Manhattan are anchored in these ancient mountain cores. 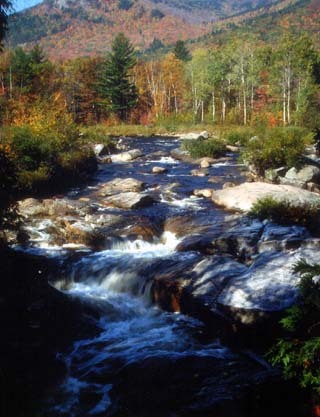 The most unique area of the state in many ways is the Adirondack Region. It contains some of the oldest rocks in the country, over one billion years old. They, too, are the cores of ancient mountains. In fact, the Adirondacks are part of the great Canadian Shield. The region, however, has recently been uplifted in a huge dome that dominates the northeastern part of the state. In fact, it is still rising, by a few millimeters per year. (Occasionally, there are minor earthquakes in the Adirondacks). So we have the strange situation of young mountains made of very old metamorphic rock. As a result, the Adirondacks form a remote region, one of the last parts of New York to be settled. Much of it is still wilderness today, much to the delight of its many visitors. An excellent color relief map of New York can be found at the Color Landform Atlas. The highlands stand out very clearly: the Adirondacks (in Northeast New York), the Allegheny Plateau/ Catskills (along the southern border with Pennsylvania), and the Taconic Mountains/ Hudson Highlands (along the border with New England). These form natural barriers for transportation and settlement. However, these barriers are breached by some very important lowlands, that form a giant sideways “T”. This shows up clearly on the relief map in green. 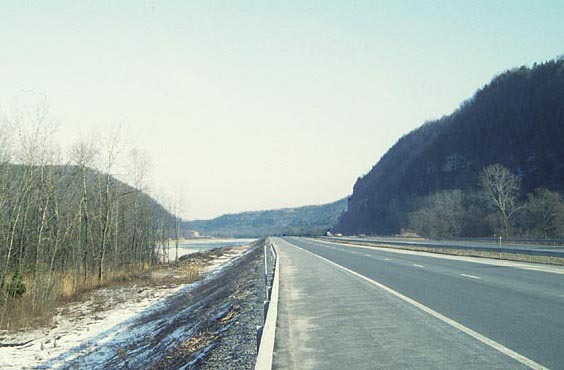 Glaciation in New York State: New York has been through many periods of mountain building and uplift, separated by millions of years of erosion. One such period occurred in very recent geologic time, the Ice Age. In fact, it ended in New York only about 8000 years ago. The glaciers were about one to two miles thick, and they covered almost all of the state, except for a small section in Southwest New York, known as the Salamanca Re-entrant. The moving ice sheets scoured and rounded the Adirondack Mountains, and they dug out many deep "U-shaped" valleys, especially in the Finger Lakes Region. Glacial erosion is responsible for the fjord of the Hudson River. (Tides on the Hudson reach Albany). The huge ice sheets carved out the basins that became the Great Lakes (and the hundreds of smaller lakes found all over New York). When the glaciers finally receded, they left behind deposits of rocks and dirt, filling many valleys with rich, fertile soil. These deposits are also visible throughout the state as drumlins (Central New York/Finger Lakes) and moraines (Long Island, and the Southern Tier). Some of these moraines that diverted the courses of rivers in New York, such as the Genesee and the Allegheny Rivers. Finally, the meltwaters of the receding glaciers had a major influence on the topography of New York. One of the escape routes went down the Mohawk Valley. It deepened the valley, and at Little Falls, it actually breached a divide, leaving behind a low-level route that would one day become the Erie Canal. 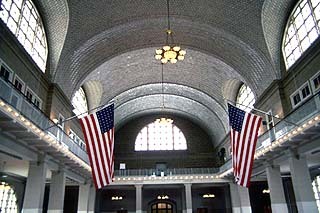 The landscape of New York is in many ways unique to the North American continent. The modifications made by the Ice Age have had a major impact on the human and economic geography of the state as well. 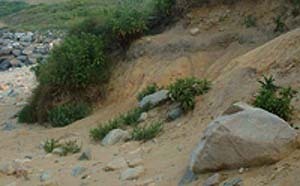 Glacial till on Long Island's north coast. The Berby Hollow near Bristol, NY. This is a good example of a glacial trough. 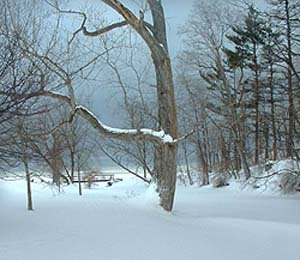 The south shore of Lake Ontario is one of New York's infamous Snow Belts. WINTER: A popular joke goes something like this: "There are four seasons in New York - almost winter, winter, still winter, and construction." This is an exaggeration, of course, but winter is very long! In the Adirondacks snow can stay on the ground from October to May. On Long Island and New York City, snowfall is less frequent, but it happens. Temperatures range from below zero in Northern New York to around freezing (32 °F) in the south. The Tug Hill Plateau, north of Rome, is one of the snowiest places in the country, with around 200 inches (or more) annually. So, if you like outdoor winter sports, New York is the place to be. Long Island does not receive much snowfall, compared to other parts of the state. 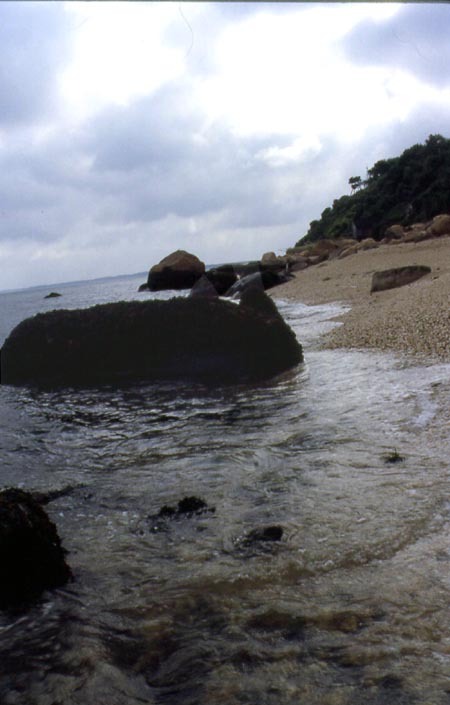 Also, being surrounded by the ocean helps to modify the temperatures, so winters are not bitterly cold here. The Adirondacks have a special (and unwelcome) spring season: black flies. When they are swarming, you don't want to be outside! 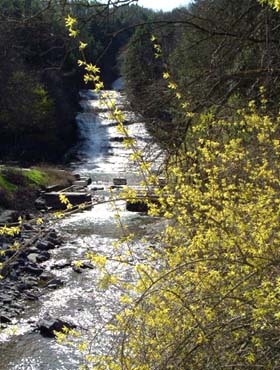 Forsythia blooms in late-April in front of Buttermilk Falls, Ithaca, NY. Springtime brings back tourism to New York, an economic necessity for most parts of the state. 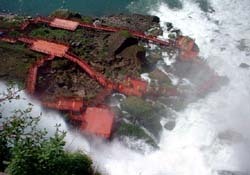 Popular destinations, like Cave of the Winds at Niagara Falls reopen for the season. New Yorkers appreciate the end of winter more than people in the Sun Belt, since we suffer more! Visitors from other parts of the country are often surprised by how green New York State is during the summer months. It is a time for regrowth and renewal. 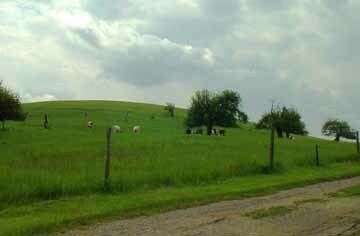 The warm temperatures of summer and the abundant rainfall make it possible for agriculture to flourish across the state, as shown in this dairy farm in Farmington, near the Finger Lakes. Summer is long enough in New York for the growth of Eastern Hardwood Forests. 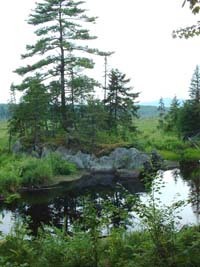 One exception is the higher elevations and bogs of the Adirondacks, where coniferous forests dominate. The months of June, July, and August are delightful in New York. This is the time where people come outside to work in their gardens, hit the beaches, camp in the mountains. Temperatures are generally in the 70s and 80s, but 90° plus readings are possible, especially in metro-New York City. There usually is a sizeable amount of precipitation in summer, usually from thunderstorms. The storms can be violent, but tornadoes are not common events. Throughout the state, autumn is the time for harvesting fruit, especially apples (near Lake Ontario) and grapes (Hudson Valley, Long Island, Finger Lakes, Lake Erie). 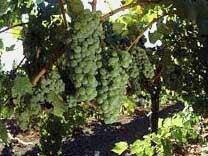 The modifying effect of large bodies of water prevents early frosts, which makes this bounty possible. September is a month of transition in the Northeastern United States. Temperatures start to cool dramatically, as the length of daylight drops below 12 hours. The first frosts of the season occur in the higher elevations, especially in the Adirondacks. 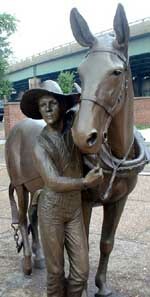 This begins the season of fall foliage, which is spectacular throughout the state. The peak for vibrant colors varies from late -September in the mountains to late-October in Southern New York. Autumn is also harvest time in New York, and farm markets all across the state do a booming business. Wine tastings and apple cider are local traditions. In November, snowfall is possible anywhere in the state, although it usually doesn't last until December. Early October on the Ausable River, near Wilmington in the Adirondacks. Whiteface Mountain is in the background. There are important differences in climate from place to place. Temperatures are modified by nearness to water, especially on Long Island which faces the Atlantic Ocean, and, to a lesser extent, the south and east shores of the Great Lakes. The High Peaks, such as Mt. 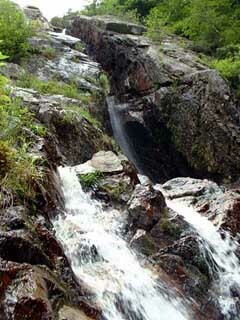 Marcy and Whiteface Mountain, have alpine, tundra-like climates. Much of the state can boast of beautiful Eastern Hardwood Forests (sugar maples, oaks, beech, and birch). Higher elevations, however, are covered with evergreens - pines, spruces, and firs. Of course, much of New York was long ago cleared of forests to make room for agriculture (although many forests have returned as secondary growth). 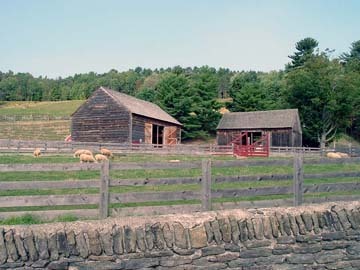 Dairy farming is common throughout much of the state, and fruit orchards and vineyards dominate areas near the Great Lakes, the Hudson Valley, the Finger Lakes, and Long Island.